January 24, 2019 | Press Release | Cosmo Oil Co.,Ltd. Cosmo Oil Lubricants Co., Ltd. (President and Representative Director: Mr. Yoshimitsu Sunano), a subsidiary of Cosmo Oil Co., Ltd. (President, Representative Director: Mr. Shunichi Tanaka), has signed a Memorandum of Understanding (hereinafter "MoU") on alliance in lubricants business with CEPSA COMERCIAL PETRÓLEO, S.A.U. (Representative: Mr. Álvaro Díaz Bild), a subsidiary of Compañía Española de Petróleos, S.A.U. (Director and Chief Executive Officer: Mr. Pedro Miró Roig; hereinafter "CEPSA"), Spanish integrated oil company. This MoU has been signed under the agreement*1 on strategic comprehensive cooperation in oil related business that was reached in 2014 between Cosmo Energy Holdings Co., Ltd. (President and Representative Director, Chief Executive Officer: Mr. Hiroshi Kiriyama) and CEPSA. Cosmo Oil Lubricants Co., Ltd. and CEPSA COMERCIAL PETRÓLEO, S.A.U. aim to take advantages of both companies and expand the lubricants business to new markets. Sharing the technology that both companies have and the manufacturing and marketing network in Europe of CEPSA COMERCIAL PETRÓLEO, S.A.U. and the one that Cosmo Oil Lubricants Co.,Ltd has, allows both of us, Cosmo Oil Lubricants Co., Ltd. and CEPSA COMERCIAL PETRÓLEO, S.A.U., to access to the markets that we have not reached. Cosmo Energy Holdings Co., Ltd. and CEPSA, both of which has the same shareholder, Mubadala Investment Company (hereinafter "Mubadala"), have been exploring opportunities for collaboration in oil and gas exploration and production and oil related business as members of the Mubadala Group. This has culminated in the signing of this MoU in the lubricants business. Cosmo Oil Lubricants Co., Ltd. specializes in lubricants and greases and boasts an integrated supply chain, covering everything from research and development (R&D), manufacturing, sales and to quality control. It has developed numerous kinds of lubricants and greases by the formulation technology it has accumulated over the years. Cosmo Oil Lubricants Co., Ltd now has the capacity to supply its products globally, with a focus on North America and Southeast Asia as well as Japan. This business alliance is meant, among others, designed to share Cosmo Oil Lubricants' formulation technology and CEPSA's manufacturing and sales networks in Europe for building a structure for manufacturing and selling Cosmo lubricants in the region, including pursuing greater efficiency in aspects related with formulations and implementing original equipment manufacturing. 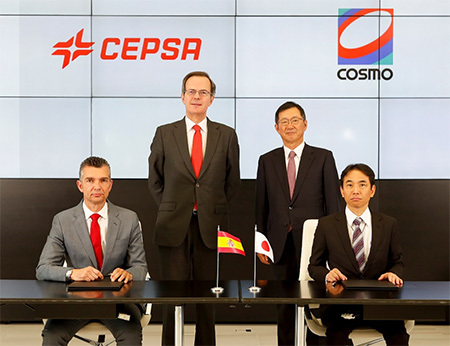 Cosmo Energy Group and CEPSA will continue to explore the possibilities of new business opportunities in various areas to improve the corporate value of both companies. *1 Cosmo Oil Co., Ltd. (Current: Cosmo Energy Holdings Co., Ltd) agreed and signed the contract with CEPSA on January 21, 2014.